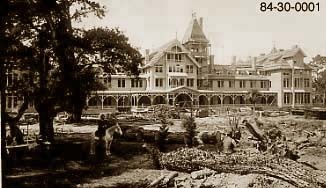 Fire of September 28, 1924 3:00 A.M.
Hotel Del Monte was opened on June 10, 1880 by Charles Crocker and the Pacific Improvement Company. Crocker died at the Hotel on August 14, 1888. The hotel burned twice -- first on April 1, 1887 and again on the night of October 28, 1924. The Old Del Monte golf course that opened in 1897 is the oldest in continuous operation west of the Mississippi River. 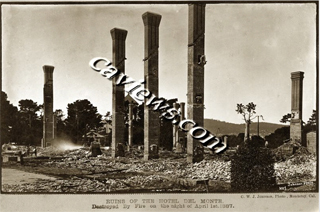 The hotel was damaged and two people were killed by the April 18, 1906 Earthquake. We have photos of the Hotel Del Monte Art Gallery that opened in 1907 and St. John Chapel Episcopal Church. 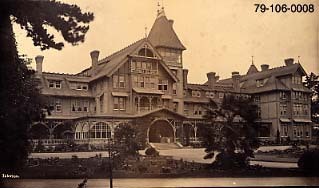 In 1908 The Great White Fleet visited Monterey from May 1-4, The Del Monte Hotel was hosted a grand ball for the officers of the fleet. A new Hotel Del Monte was built in 1926-27 and in 1943 was used as a Navy pre-flight training school. 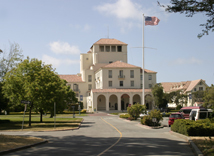 The Navy purchased the hotel and 627 acres in 1947 for 2.5 million and it is now the home of the Naval Postgraduate School since 1951. Floral designs: badge of the Grand Army of the Republic at Hotel Del Monte by landscape architect Rudolph Ulrich. We have over 1,055 photos of the Hotel del Monte, a hand-colored panoramic photo by W.H. Jackson, the Del Monte race track and the polo field, the Del Monte Bathhouse, Hotel del Club House, Del Monte train station, Roman Plunge and the Old Del Monte Golf course and Pebble Beach golfing and city of Seaside, Monterey Co. in the collection. 1924 was a year for fires with Del Monte Hotel and the Associated Oil Tanks on September 14th. We also have the famous photo of the Old Navy taken on board the USS Mohican in 1888. And other Military photos from our archives. Holdings: over 28,000 Photos of Monterey County listed in our database. And over 81,955 Historical California images in our Photo Archives. We have over 35,000 historical California images listed in our database and can provide a computer generated list by subject, place, date, photographer and format or any combination of the above for a small fee. All images are also available for editorial downloads and one-time editorial use. A list of books, magazines and television programs that have used photos from the photo collection.